In the beating business heart of London, Banking Technology met Ben Brabyn, head of tech hub Level39, for an exclusive interview on Brexit, rivalry and how success isn’t a zero-sum game. It’s not Hollywood, but the home of Level39 in Canary Wharf. An elegant and modern hub that houses a variety of tech firms looking to scale up. Not all are fintech – but make no mistake, all are ambitious. 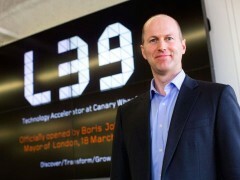 Level39 was founded in March 2013, but as part of the Canary Wharf Group it inherited its reassuring infrastructure. However, the hub did start with one company becoming a member and today that has grown to 200 firms. If you don’t know Canary Wharf, it has a similar vibe to London’s other financial centre – the City. Both places are full of money and ambition. No one dawdles and meanders around like you find in most parts of London. Canary Wharf and Level39 aren’t places full of lame excuses, lethargy and litter. This is innovation and aspirations for success in its purest form. As CEO of Level39, Brabyn brims with enthusiasm over his role and what the place can offer. There are no negative thoughts in our entire interview – issues such as Brexit or rival cities are smoothly batted away with assured strokes. Because of the importance of security within fintech and its growing relevance, Brabyn believes banks are interested in this because new technology exposes them to new risks. And in turn, these are the people who “can write the big cheques to our member companies”. It’s difficult to argue with this, as just looking out of Level39’s window reveals the big names and big buildings of many a major player. The community in Canary Wharf comprises 120,000 people and they come from all around the world. These individuals also provide connections to other people all around the world. The stats come thick and fast from him as there are 48 different nationalities in Level39, and 1,000 people working for the 200 different firms. In addition to this world within a world, he says there are 150 mentors “orbiting around us” – such as senior execs in financial services, investors, regulators, academics, tech experts and those from different branches of government, in the UK and elsewhere. If you’re enticed by his logic, location and statistics, then how do people get into the hub? “It’s not easy to be a successful entrepreneur but to get into Level39 you have to do three things. “First is to have a minimum viable technology with the potential to scale globally. “Second, the willingness to participate in our innovation community – don’t hide away. In terms of the 200 firms, Brabyn didn’t want to get into a naming game as there are so many and it would not be wise to pick favourites or attempt total recall. However, he did mention the largest one. This is cybersecurity firm Digital Shadows, which identifies cyber threats, data leakage and reputational risk. It started with a team of six and now employs over 90 people. They are biggest in terms of employees and office space. As you’d expect, Banking Technology has reported on other firms to get help from Level39. These include Taplend, which last year launched in the UK offering a combination of peer-to-peer (P2P) and payday lending. Also, smart document management provider ClauseMatch, which was picked by Barclays for handling policies and standards. And Babb App, a start-up that is creating a bank based on a “permissioned” blockchain implementation of a distributed ledger (using Ethereum smart contracts). Babb was accepted into the Level39 Accelerator Space in June last year. In his position there is no typical routine. The day before our interview he had been in Belfast at the invitation of a member company. This is an excerpt. The full interview is available in the July/August 2017 issue of the Banking Technology magazine. Click here to read the digital edition – it is free! EY is inviting start-up tech companies to compete in a competition looking for solutions to the problems posed by “right to be forgotten” regulations.